Despite significant coverage in the American media, the 50th anniversary of the march in Selma, Alabama that led to passage of the 1965 Voting Rights Act went almost unnoticed in the Bahamas. And it’s a safe bet that most Bahamians who didn’t actually live through those tumultuous years are clueless about what happened in their own country at the same time. Hint—the two experiences are closely related. The substance of these experiences was the suppression of democracy - denying citizens of African descent their right to vote. In the US these citizens were a minority. In the Bahamas, they were the majority. The ancestors of both groups were enslaved for centuries. The 15th Amendment to the US constitution, ratified in 1870, after the civil war, prohibited states from denying the right to vote based on “race, color or previous condition of servitude.” This superseded laws that had directly prohibited black voting. Southern states passed laws that included poll taxes, literacy tests, vouchers of "good character," and disqualification for "crimes of moral turpitude." These were designed to exclude black citizens by allowing white officials to apply them selectively. By 1910 nearly all black citizens in the former Confederate states were disenfranchised. The long struggle to restore those rights was one of the major focuses of the US civil rights movement, which was led by Rev Martin Luther King jr.
Selma is a county seat with a county-wide majority-black population, but in 1961 only 130 blacks were registered to vote. When a Selma judge banned public gatherings focusing on civil rights, a number of black organisations joined to protest the injunction. Following a series of violent police attacks on peaceful protesters, and more than 3,000 arrests, some 600 ordinary people attempted to march from Selma to the Alabama state capitol in Montgomery on March 7 1965. The marchers made their way across the Edmund Pettus Bridge, where they faced a blockade of state police who ordered them to disperse. Cheered on by white onlookers. the police attacked the crowd with clubs and tear gas. Mounted officers chased retreating marchers and continued to beat them. The infamous bridge was named in "honour" of a Confederate general. Edmund Pettus was one of the organisers of the white supremacist Ku Klux Klan and he maintained a virulent opposition to the constitutional amendments that elevated former slaves to the status of free citizens. Along with numerous other acts of violence and terrorism against non-violent protesters, the unprovoked Selma attacks persuaded President Lynden Johnson to push for effective voting rights legislation. And the Voting Rights Act was signed into law in August of the same year, in the presence of civil rights leaders. Similar events happened in the Bahamas for similar reasons at about the same time. There was just as much drama, but much less violence. In 1962, despite polling more votes overall, the predominantly black Progressive Liberal Party actually lost two seats in the 33-seat House of Assembly, while the mostly white UBP won 20 and four independents were elected. Much of the blame for that debacle fell on the way constituency boundaries had been fixed by the UBP - a process condemned as gerrymandering. Retired governor-general Sir Arthur Foulkes told me he met Dr King on his first visit to the Bahamas in the late 50s/early 60s: "He came at the invitation of a mutual friend, Basil J. Sands, a young black Bahamian real estate agent. "It was in Basil's office that several of us, including Randol Fawkes, had a conversation with Dr King. We talked about our struggle against racism in the Bahamas and listened as he outlined his non-violence philosophy. He was an inspiration to all of us who were in the progressive movement at the time." In 1963 the young leader of the PLP - Lynden Pindling - took part in the March on Washington, when Dr King delivered his famous 'I have a Dream' speech. Inspired by the dramatic events in America, Pindling and the more activist members of the PLP decided on “symbolic but shocking actions” inside and outside the House of Assembly - only a month or so after the Selma outrage had occurred. The issue at hand - according to Pindling’s biographer, Michael Craton - was redistricting, and the related problem of getting an accurate and complete register of voters before the next election. There was also a perceived need to “demystify” the power of Bay Street by a successful challenge. A parliamentary debate on the constituency commission report took place in April 1965, and a core of PLP activists led by Pindling, Milo Butler and Cecil Wallace Whitfield planned a major demonstration to coincide with the debate. At the appointed time Pindling threw the parliamentary mace out of the window to a crowd of about 3,000 waiting below, while Butler hurled the speaker’s hourglass. “The effect was electric”, Craton wrote, as the PLP members walked out of the chamber and staged a sit-in on Bay Street. Magistrate John Bailey (who is now retired in Ireland) was called upon to read the riot act, and - to avoid a confrontation - Pindling led his supporters to the Southern Recreation Ground where they held a mass rally. 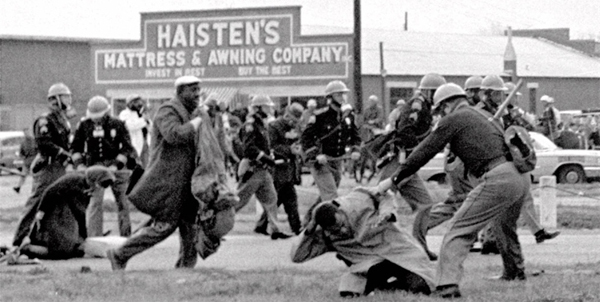 The mace incident - later dubbed Black Tuesday - served the same purpose as Bloody Sunday in Selma - "bringing attention to the fragile state of democracy,” as Craton wrote in Pindling’s biography. Although this dramatic action provoked a major split in the PLP, which lasted right up to the 1967 election, Pindling went on to become the country's first black premier in a razor-thin vote. The following year, in a snap election, the PLP were returned to office in a landslide. And the rest, as they say, is history. Bloody Sunday and Black Tuesday had similar meaning for both Americans and Bahamians.